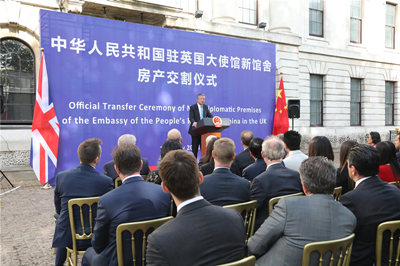 Welcome to the official transfer ceremony of the New Diplomatic Premises of the Chinese Embassy in the UK. It is a pleasure to have you with us to witness this historic moment. In 1877, 49 Portland Place became the premises of China's first diplomatic mission abroad. It has since witnessed three centuries of changes and transformation in China and the world. It also carries the glory and the dream of generations of Chinese diplomats. Today, after 141 years, the Chinese Embassy in London is going to have a new home! As the Chinese Ambassador overseeing this historic moment, I have so many thoughts that I want to share with you. But in the interest of time, I only want to mention three significances of this new premises. First, it is a golden fruit of China-UK "Golden Era". Since President Xi Jinping's successful state visit in 2015 unveiled the "Golden Era" of China-UK relations, our two countries have further enhanced political mutual trust and deepened exchanges and cooperation in various fields. Early this year, Prime Minister May paid a successful visit to China, where the leaders of our two countries reached important consensus on building a more strategic, practical, global and inclusive China-UK relationship. These have made China-UK relationship a good example of win-win cooperation and common development between China and the West. Today, we are here to mark a major purchase of China's diplomatic premises since the founding of New China. I regard it as a fresh golden fruit of China-UK "Golden Era". Second, the new premises is the new image of China's diplomacy in the new era. An embassy is the face of a country. Our current premises in Portland Place has gone through many renovations in order to meet the growing needs of our diplomatic mission. However, the new era is calling for a new premises consistent with China's current role and influence in the world. 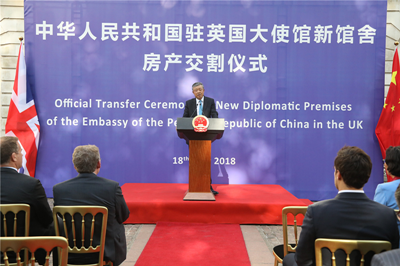 I am confident that after the renovation, the new premises of the Chinese Embassy will become a new landmark in London and a new face of China in the new era. 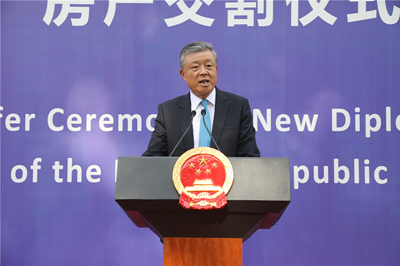 Third, the new premises embodies China's dream for a harmonious world in the new era. Family is an important concept in the Chinese culture. In the Chinese language, the characters for home, security and tranquility all have in them the pictograph symbolising family. 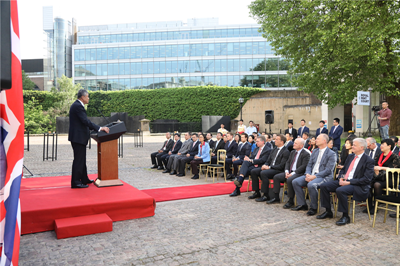 The Chinese Embassy in the UK is a big, loving and hardworking family of diplomats striving for a harmonious world -- for the "one big family of mankind". This is Chinese diplomats' dream for the world. This dream for the world is to build a community with a shared future for mankind. Today's event, I believe, has given a new meaning to the Royal Mint Court, that is, RMC also stands for the Right Monument of China. Standing in front of the new Chinese diplomatic premises, I feel deeply that we are living this Right Moment of China and we are witnessing the Right Monument of China. Not far from here, the River Thames has quietly and softly flowed for centuries, giving birth to the British civilisation and adding splendour to the crown jewels of world civilisations. Today, the Thames is bearing witness to the historic moment of the transfer of the new diplomatic premises of the Chinese Embassy in the UK. Indeed, history is like a river that flows steadily and firmly forward. Follow and keep abreast with its current, we can ride the tide of the times. I sincerely hope that China and the UK will seize the historical opportunities and stay ahead of the tide of the times. I hope our two countries will work together to write a new chapter for China-UK "Golden Era" and make new contribution to the building of a community with a shared future for mankind. I wish to thank London Borough of Tower Hamlets for your support in planning. I also want to thank Delancey, CBRE, Addleshaw Goddard and Mishcon for all your efforts in the whole process.